Petracovich - "Blue Cotton Skin"
Here are some basic things I’d like to state for the record: Wal-Mart is destroying the music industry. Music is changing. Most new hip-hop music is garbage from both a songwriting and music production standpoint. And finally, Jessica Peters from Petracovich has both the vision and musical ability to sell 5 million records. 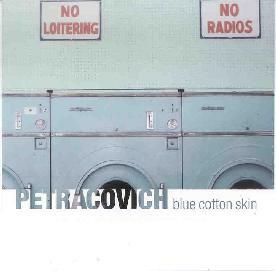 The Petracovich release is entitled, Blue Cotton Skin. What a solid job here! Ms. Peters is a new breed of independent artist; she combines convention with the unconventional and the end result is an immensely inspired and thoughtfully focused musical epiphany... and... she’s only a girl! After creating a masterpiece such as this, you’d think she’d stop. Not so. She created her own label, hit the road and has garnered major-market radio airplay from Seattle to Honolulu. And, she’s just getting warmed up. I’ll make this as concise as possible: Blue Cotton Skin is dripping with emotion for every ambient electronic minute. Jessica’s voice is absolutely refined. She displays a true talent for lyric crafting throughout the album as well. It is both lo-fi and downright breathtaking at times - a task difficult to pull off for most artists. Not only do I respect Ms. Peters for what she is doing musically, I also admire her overall drive and talent. In short, she is just breaking down the doors, and that is the truly beautiful thing about Ms. Peters and others of her ilk. High points include: Nighttime, Fall from Trees, Bird’s in Flight and Rosebud. For more information you can visit the Red Button Records web site at: http://www.redbuttonrecords.com. Contact via snail mail c/o Red Button Records; PO Box 761; Carpinteria, CA 93014-0761.